Egyptian hieroglyphs offer a parallel to King Mosiah's monetary system. 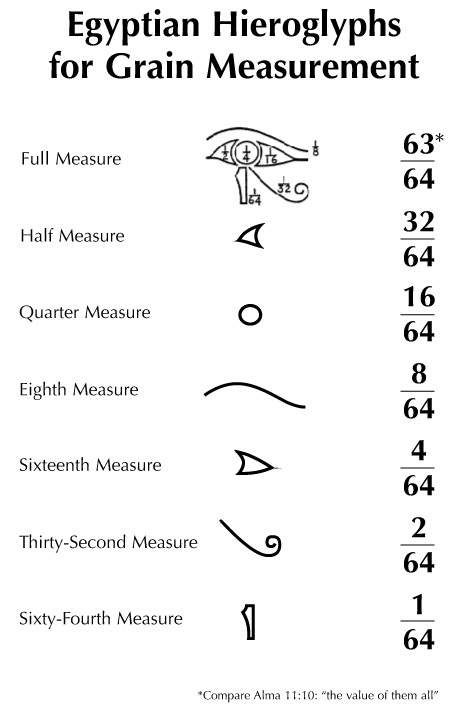 The grain measure in ancient Egypt was represented by the eye of Horus. Each part of the eye represented a fraction of the grain measure. There were six parts. The smallest measure was 1/64, represented by the tear duct; the next was 2/64, represented by the eyelash; and so on. The sum of all the parts equaled 63/64, which was considered the full measure. Mosiah's weights and measures were similarly exponential, with the largest equaling "the value of . . . all" (Alma 11:10) of the main lesser amounts. Although the Nephite system is not exactly the same as the Egyptian, the similarities corroborate the report that the Nephite kings studied "the language of the Egyptians" (Mosiah 1:4) and drew on their Old World backgrounds well after their arrival in the New World.